In September 1, the 101-story Shanghai World Financial Center (SWFC) finally opened after 17 years of tumultuous development. Initially constructed to be the tallest building in the world, unfortunately for Minoru Mori, 73-year-old property tycoon and owner of half a dozen skyscrapers, the tower failed to retain the title. 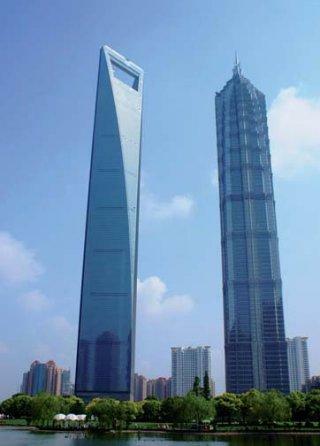 The Shanghai World Financial Center is 492 meters high, with 101 levels and the world’s highest observation deck. When the $1 billion construction began in 1997, the area was mostly wetlands and peasants—not the financial center it is today. Since then, work had to be temporarily halted, first due to funding shortages caused by the Asian financial crisis, then by September 11, followed closely by the SARS outbreak. Adding to the problems, some of the original Japanese investors decided to abscond, leaving Mori to buy out their equity and raising his stake in the building from 30 percent to 80 percent, according to some reports. Then, in 2003, height restrictions were also placed on the building, causing the planned 509.2-meter tower to be reduced to its eventual height of 492 meters. The building has already lost the height competition—first place goes to the 688- meter Burj Dubai skyscraper in the United Arab Emirates, which is still under construction. The world’s second tallest building, if you include the spires, is the 509-meter Taipei 101 tower in Taiwan. However, Mori has one saving grace—his building has the world’s tallest observation deck, 474 meters up on the 100th floor. But the construction did not go smoothly. In August 2007, a small fire, thought to have been caused by the workers’ electric welding, broke out on the 40th floor. Although no one was injured, 1,000 workers were forced to evacuate the premises. Mori Building were unavailable to comment on the incident or any other aspects of the company. The problems didn’t stop after the completion of the building. The SWFC has failed to secure its most desired residents— foreign companies—due to the ongoing subprime crisis. Stagnating US and European companies which were planning to enter the Chinese market have put off leasing the building’s space. At a news conference in August, a Mori Building spokesperson said that the new Shanghai complex would open with an occupancy rate of 45 percent, which it intends to double the next year. The company also said it has secured an average daily rent of 3 dollars, equivalent to monthly rent of 30,000 yen, or more per square meter. Initially, the plan was to have 70 percent of its tenants be non-Japanese firms but instead, currently, about half the tenants are Japanese companies, according to the spokesperson. Morgan Stanley, which made a small investment in the building, is not on the list of tenants as originally expected. Closer to home, Mori had also faced problems, namely due to its controversial Roppongi Hills complex. Opened to the public in 2003, the mega-complex incorporates office space, apartments, shops, restaurants, cafés, movie theaters, a museum, a hotel, a major TV studio, an outdoor amphitheater, as well as a few parks. "Roppongi Hills has retained an image of housing the new-money ‘Roppongi Hills Zoku’ or Roppongi Hills Tribe,’ characterized by the flamboyant venture IT and investment fund-related companies." In contrast, Mori’s rival company, Mitsui Fudosan Co., created the 370 billion yen Midtown complex just ten minutes from Hills, and with a fresh and sophisticated image it has a greater pull these days for the business elite. Unsurprisingly, Yahoo! Japan has moved most of its operations to Midtown, and ironically, Goodwill group—who are essentially part of the original tenants to taint the Hills reputation—as well as Konami, have all abandoned the building in favor of the so far less scandalous Midtown. Adding to Mori’s reputation is the building mogul’s “ruthless” removal of former residents and plot owners from the area. Also complaints of noise pollution and radio-wave interference by the Hill’s Mori Tower have further compounded the problem. 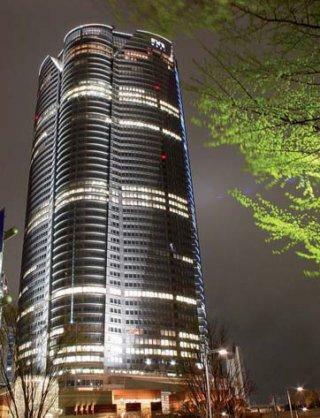 Roppongi Hills is Mori Building Co.'s, signature building, with 54 stories. However, the most damaging incident involving the building was the death of a 6-year-old boy, crushed by revolving doors within the Roppongi Hills complex. Ryo Mizokawa was killed in March 2004 after the doors on the second-floor entrance to Mori Tower failed to detect his presence and his head was crushed. During the investigation, the Mori Building Co. offices were raided, and it was discovered that prior to this incident, a number of similar cases had taken place, leading to two Roppongi Hills executives being indicted on charges of professional negligence. The case was the subject of media attention for months, and continued to tarnish Mori Building Co.’s reputation, concreting its image as a fast-buck making, high-risk taking company. Minoru Mori was criticized in the media for prioritizing the appearance of the skyscraper over the safety standards of the building. Mori’s future plans are to develop more multipurpose real estate complexes. He believes that the future of the Asian cityscape will be huge skyscrapers, which cut down on the surface area required, thereby making way for more greenery in the surrounding areas and creating an environmentally friendly city. He has repeatedly said that further Asian expansion is on the cards, with serious studies being undertaken for the development of Singapore, as well as possibly South Korea, Thailand and Vietnam. Although the company looks financially very profitable, with record profits in 2006, there has also been much made of the fact that it is also seriously in debt. After the economic bubble burst, reports showed that the company held nearly 1 trillion yen in accumulated debt, making it difficult for the company to secure further financial support from the banks. In 2002, Mori Building Investment Management was formed, seemingly to create non-bank financial support services. As popularity for real estate investment trusts grew, it secured a license to also manage REITs in 2005.